Just under five years ago olive oil producers in Italy and other southern Europe countries started to notice that some of their olive trees were dying. They were becoming dried out and twisted. Some sort of disease was attacking the trees, some of them hundreds of years old, transforming landscapes and threatening an ancient agricultural activity that has sustained communities for centuries. On the Forestaforte plantation in Ugento in the south of Italy 4000 olive trees used to thrive. It has been in the same Italian family for almost five hundred years. 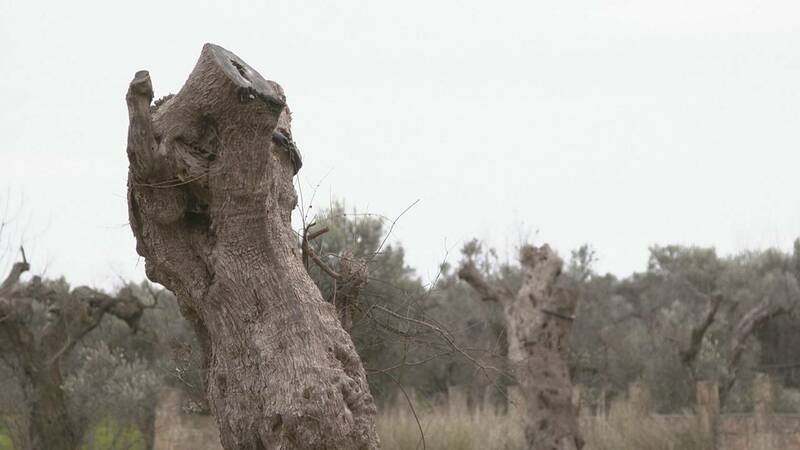 Then, just a few years ago, bacteria, since identified as Xylella Fastidiosa, started to attack the trees, drying them up and killing them slowly. "My output has plunged by around 80 percent in just three years," olive oil producer Giovanni Melcarne told Euronews. "This disease has completely destroyed the landscape and our production system. Any eventual recovery will be very slow." The ruined plantation is now an experimental field for researchers and students from Europe, Northern Africa, the Middle East and Iran. They are involved in an European research project aimed at establishing early diagnostic tools and sharing knowledge to tackle the problem. "The sooner you can identify the disease, the more guarantees you have to face it," explained Maroun el Moujabber, an agronomist with the Cure-XF project. "So this is the first thing we are doing. The second thing is to share scientific knowledge. Because this fight against the disease must be multidisciplinary. We must fight it not only from a biological perspective, but also using tools from other areas like sociology, economics and biotechnology." The bacteria is mainly transmitted from tree to tree by insects. Researchers first had to identify and characterise the pathogen, which was a challenge. "It's bacteria that exclusively colonise and act inside the vessels of the wood." said Donato Boscia, a phytopathologist with the Italian National Research Council. "It blocks water and mineral salts going from the roots to the leaves. Everything happens exclusively inside the tree. This makes this disease so difficult to deal with." As yet there is no known cure for the disease, but early diagnostic tools and apps for pathogen monitoring have been developed and are being tested to prevent its expansion, and now researchers are looking to the future. "The bacteria is now considered endemic in the affected regions," according to Franco Valentini, an agronomist at Ciheam-Bari. "That means that it's no longer possible to eradicate or eliminate it. So we must learn how to live with it. And one way is by developing plants that are resistant or show a low susceptibility to the disease." Another agronomist from the Italian National Research Council, Pierfederico Lanotte, says they are making progress. "We've already identified two varieties that are resistant to the disease, known as leccino and fabolosa. But this is only the start, as our objective is to find more varieties that are even more resistant." Potentially resistant varieties are grafted on to affected trees for closer monitoring. Local olive oil producers like Giovanni Melcarne, say they hope this research will eventually help them. "We clearly need to increase biodiversity; we need to think of other olive tree varieties. This will help create a buffer zone and a natural barrier that could guarantee us a better future."